It’s no wonder with so many places and stuff that would please all the senses that New York City is the city that never sleeps. There’s the Statue of Liberty, Central Park, the Madison Square Garden and God knows what else. The cost of living, especially rent expenses, is still sky-rocketing in New York City. When it comes to shopping, don’t think that New York City is just all about Macy’s. Of course not! There are a lot of bazaars that are ongoing throughout New York City and all you need is an efficient guide to help you out. For tourist spots, you shouldn’t believe that everything in New York City comes with a ticket price. In fact, just walking in downtown New York is a sight to behold in itself. So the only problem is, where to stay? Before I share with you a list of New York City hotels that could interest you, first, I have to warn you that what’s termed as “affordable” in New York City may not be “affordable” in your vocabulary. So if you’re cash strapped, better check first if you’ve got some friends living in New York City who’d lend you a room for a week or two as you go sight-seeing. New York is a city of high rise towers and a number of those are hotels that you can take your pick of. These buildings range from the five star hotels to the funky ones to hotels with “affordable” packages. Four Season Hotel: if you’ve got kids, then you should consider staying in this kid-friendly hotel because guests under 18 can stay for free. The tallest hotel in New York City, it also provides its family guests with coloring books, a video lending library and welcome gifts for kids. Soho Grand Hotel: if you’re the type of traveler who can’t bear to leave your pet behind, have no fear because there are several hotels in New York that can accommodate furry guests, just like the Soho Grand Hotel. Upon checkout, you’ll even be given a goldfish to remember your New York holiday. Affinia 50 Suites: this particular hotel has no difficulties in landing a Top 10 spot in any survey when it comes to being the best hotel in New York City. Previously known as the Plaza 50 Suites, this is a no-fuss-comfort-zone for travelers who want basic accommodations that would also be easy on the pockets. Large suites equipped with kitchenettes are also available if you so prefer. Hilton Times Square: Never mind Paris Hilton and her notorious antics. At least her family still hasn’t stopped at being one of the best when you’re talking about hotel services. The Hilton Times Square is one of the poshest hotels in New York City, with a twenty-five-seater theater and even its own wax museum! And just because it’s posh, don’t assume that the staff would turn its nose up on noisy, bratty kids or dirty, scrambling house pets. Nuh-uh! The Hilton Times Square aims to please all forms of guests, human and non human, adult and kids. So now, all you need to do is choose which hotel you’re going to stay, pay the bill, enjoy the scenery and of course, tour New York City! 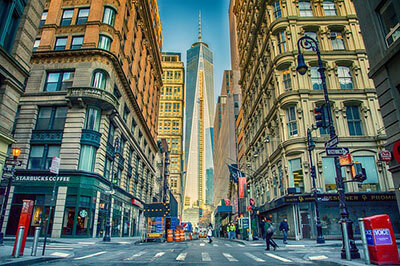 Enjoy New York City with great deals from hotels.com!